Taking captivating photos at children’s parties. Anticipating a party? There are a few shots that are musts at children’s birthdays. In order to avoid missing these milestone moments, arrive at the party venue 15 minutes early to begin a successful day taking frame-worthy photos of the special occasion. For starters, photograph the immediate family of the birthday tot at the party place. If the party is for your own child, ask the event staff to snap at least three photos with you in the shot. Detailed shots of the decorations and the cake should also be taken before everyone begins to arrive. As the party starts, focus on getting shots of your children with their closest friends. A group shot of all the kids is also terrific and may be included in a thank-you card, which is always appreciated by the parents of classmates. Action shots can be tricky, but most cameras have several settings. The manual should reveal how to set your camera for an action shot to capture movement. For example, at gymnastics parties, you want your camera set to action if you are taking a photo of your child walking on the balance beam, jumping on the trampoline or swinging on the parallel bars. Candid shots of the birthday boy or girl with various family members and friends are especially cherished. Shots that are not posed capture real emotion, laughter and love. When food and cake are served, the birthday boy or girl should be in a seat positioned well for the photos. Keep this in mind when deciding on the setup for the event. And beware of mirrors behind the birthday child. Shooting into a mirror causes the flash to reflect and is unattractive in photographs. Also, make sure there is a space for you to stand so that you have a clear view of the birthday child when the pizza or cake comes out. Take a close-up photo of the child as the goodies are served, followed by distant shots of the whole table. This helps you capture everyone at the party. And, of course, take a bunch of photographs when the birthday child blows out the candles. To assist in getting these key moments involving food and cake, ask staff or a family member early in the party when food and the cake are being served. When the designated time approaches, get into position, move anything that is in your way, hold your camera steady and have the shutter pressed slightly as your child gets ready to blow out the candles. 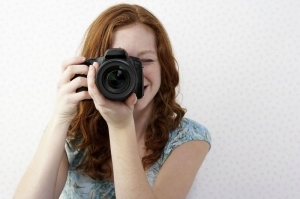 Make sure to get a close-up of your child and surrounding family members and friends. Just keep shooting! If your camera is digital, it’s best to continue shooting and edit later. Just confirm you have at least 500 photos to spare on your memory card. And always bring extra memory cards. After the cake has been served, take close-ups of the birthday child’s messy cake face. The messier kids get, the happier they generally are. This is ideal for getting ear-to-ear smiles. When the party ends, upload and edit your photos on your home computer. It is simple to make an album on www.kodakgallery.com by uploading all of the photos taken at a party. Select an album style and the photos you want to include. You can lay them out in several ways using one to four photos on each page. Use the front and back of each page, filling 30-60 pages with crisp photographs that portray the fun and festivities starring the birthday child. Buy extra memory cards for your event. You can never take too many photos. Charge your battery before the party and have an extra charged battery on hand during the affair. Arrive at the venue early for family photos. Take photos of the birthday child with his or her closest friends. Take a group shot of all of the kids attending the party. Have a staff person or family member help you set it up. Take a close-up of the birthday boy or girl eating the cake. Take a close-up of the birthday child blowing out the candles and wishing for the best of all that is to come! Jessica Leigh is often seen on assignment at prestigious events around Manhattan, housed everywhere from museums to favorite party places. She is the lead photographer for a famous children’s emporium in New York City and photographs private events in the Hamptons. For additional ideas on how to photograph kids’ birthday parties and capture children in action, check out www.jessicaleighfoto.com.